What can we learn with humans that the much safer robotic explorers cannot tell us? Is it worth the risk? Is there really any reason to go to Mars other than "because it's there?" Let’s take a realistic look at the challenges of a human expedition to Mars and examine the reality behind the 'hype' of a mission to the Red Planet. Born and raised in western Canada, Bob received degrees in Mechanical Engineering from the University of Calgary and from the Massachusetts Institute of Technology (MIT). He also holds a Doctorate of Medicine from McGill University and a Master of Business Administration from the MIT Sloan School of Management. 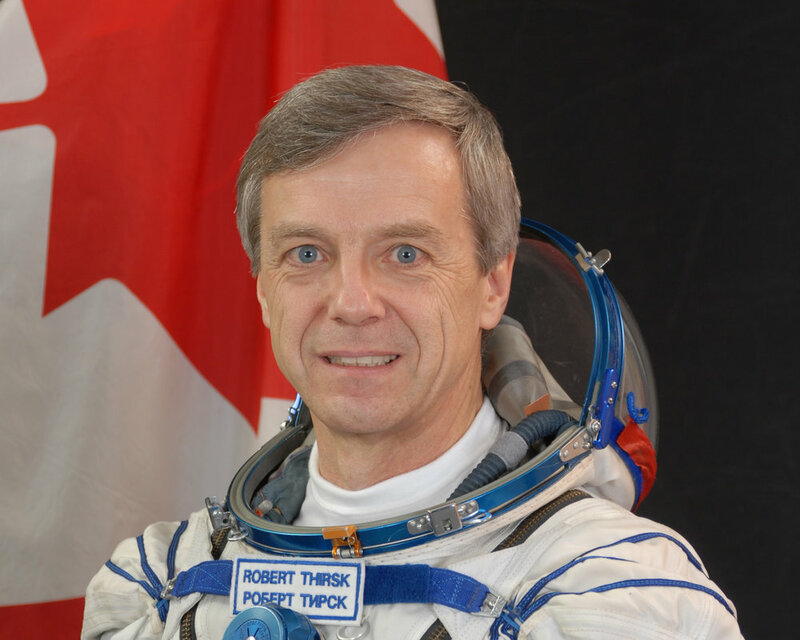 Bob has flown on two space missions as a member of the Canadian Space Agency’s astronaut corps. He first flew aboard the space shuttle Columbia in 1996 with six international crewmates as part of the Life and Microgravity Spacelab Mission. His second flight in 2009 was a six-month expedition aboard the International Space Station. Bob and his five international crewmates performed multidisciplinary research, robotic operations and maintenance of Station systems. Bob is a Chancellor Emeritus of the University of Calgary. He is a strong promoter of an economy based upon exploration and innovation. He encourages youth to build their dreams upon a foundation of advanced skills and lifelong learning. Dr. Martha Lenio, born and raised in Waterloo, Ontario, has had a life-long interest in both space exploration and environmental issues. Martha earned a Bachelor of Applied Science in Mechanical Engineering from the University of Waterloo in 2004, and completed a doctorate in Photovoltaic Engineering from the University of New South Wales (Sydney, Australia) in 2013. She has worked in the sustainable building industry, the photovoltaics industry, and academia. From 2014 to 2015 she commanded an 8 month Mars simulation with the Hawaii Space Exploration Analog and Simulation (HI-SEAS), funded by NASA. She has her own company, Mars Green Consulting, that does renewable energy consulting, mainly for solar projects. She also works for WWF-Canada as their Arctic Renewable Energy Specialist, focusing on bringing green energy to Nunavut. A part time research scientist at the Planetary Science Institute and an assistant professor at York University in Toronto, Ontario, Isaac serves as a Co-Investigator for SHARAD on Mars Reconnaissance Orbiter. His research focuses on sedimentary systems on Mars, especially related to the polar layered deposits, or ice caps, in order to gain knowledge about the past climate of Mars. Primarily, Isaac uses data from the shallow radar (SHARAD) instrument in Mars Reconnaissance Orbiter to look for reflections beneath the surface of Mars. These reflections tell us about the geophysical makeup of the deposits and the geometry in which they were deposited. Some other instruments he uses regularly include the Mars Orbiter Laster Altimeter (MOLA), the Thermal Emission Imaging System (THEMIS), and the High Resolution Imaging Science Experiment (HiRISE). In Partnership with the Royal Astronomical Society of Canada, Toronto Centre.